Quick, fellas, hop in the car! We gotta get out to El Monte pronto, or there won’t be any of the main course left. 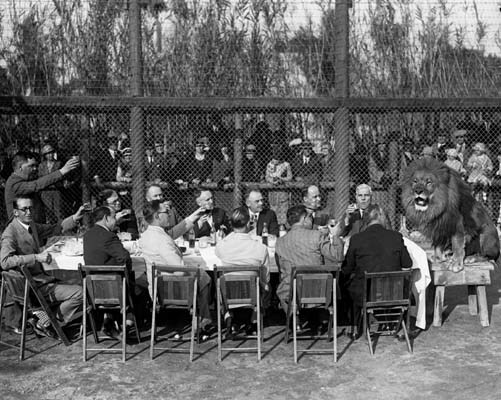 What, you mean you call yourself a Lion and you don’t want to sample a hunk of barbecued adolescent lion meat, personally prepared by the King of Beasts’ best pal Charles Gay out at his Lion Farm, as part of the celebration of the charters of the El Monte and Alhambra clubs? Getouttahere! Of course you do! Ah, don’t be a stick in the mud! We’ll sit at the big table in the middle of the lion cages, drink up some hooch and gnaw on a cat bone while telling dirty jokes and practicing our roars. And then, when we’re all good and lit up, Gay’ll bring Numa, his biggest and friendliest lion out to walk the length of the table, and we’ll toast that kitty as he’s never been toasted before. That’s the spirit, fellas, out we go. This is a big day for the Lions of Southern California, one we’ll tell our grandkids about! 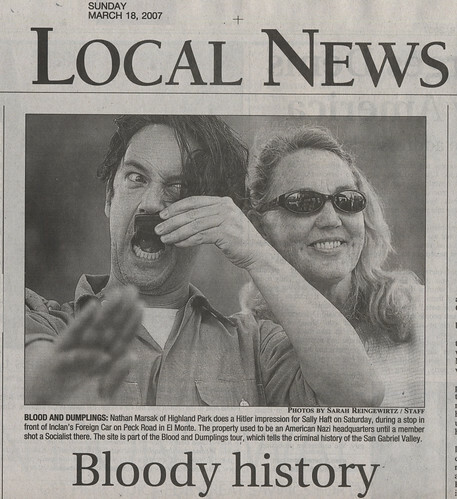 Why yes, Pasadenans, that was our own Nathan Marsak glowering out at you from page three of the Sunday paper, doing his little AH impression on the former site of the American Nazi Party Headquarters in deepest El Monte, as part of the Blood and Dumplings Crime Bus Tour. To read Molly R. Okean’s story, which oddly enough in the web version doesn’t feature Sarah Reingewirtz’ striking photograph, just click here. We had a great day exploring the San Gabriel Valley with a bus full of charming passengers, including a stop for dumplings at Monster Park (sorry about the soy sauce shortage! ), turn-of-the-century bungalow poetry from co-host Richard Schave, black cats crossing our paths and some truly chilling tales of forgotten crimes and misfortunes. Thanks to everyone who joined us, especially Sister Kelly and Brother Nathan, and watch this space for announcements of upcoming tours, criminal and otherwise. soup, nothing is more comforting and delicious. into the criminal history of the San Gabriel Valley, including the battling Nazis of El Monte, the chilling (and probably incestuous) Case of the Buried Bride, missing Salvador Dali paintings, the dark history of the Lions Club’s lion meat BBQs held in eye- and nose-range of hundreds of the lovely beasts, the Man from Mars Bandit (his mystery revealed! ), plus Phil Spector, neglected Manson victim Steve Parent, Geneva Ellroy and a peculiar East L.A. link to the JFK assassination, concealed Black Panthers and the coolest trailer parks in the Southland. Included in the $55 ticket price is a special stop for Chinese comfort food at one of the best dumpling joints in Monterey Park and an afternoon picnic surrounded by real sea monsters. Click here to buy your ticket by paypal, or email to reserve a seat that you will purchase with a money order or check. We hope to see YOU on the Crime Bus! For half a century, the Baptist Church of El Monte and the Masonâ€™s Lexington Lodge No. 104 shared a clapboard building on Main Street, the worshipers on the first floor and the Masons, as always, on the second. Then came the developers and the urge to grow. 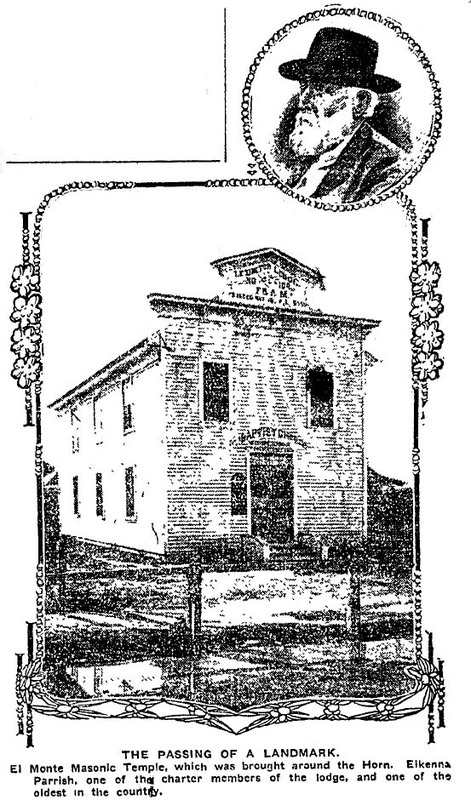 â€œSeized with the thrill of the new trolley boom, the lodge members are about to put up a new Masonic temple; the Baptists, who have shared quarters with the Masons of El Monte for more than 50 years, are also said to be ambitious for a new place,â€ The Times says. Taking the original name of the settlement, the Masons founded Lexington Lodge in May 1853, making it one of the oldest in California, and sent for regalia that came around the Horn from the East. One of the early lodge members, Elkenna Parrish, can still be seen driving his buggy around El Monte, The Times says. The Baptists, meanwhile, built the first Baptist church south of the Tehachapi, using ox teams to haul lumber from San Bernardino. The Rev. J.C. Freyer arrived after a six-month journey from Alabama and was the first Baptist minister ordained in Southern California, The Times says. The Baptists had outgrown the structure, built in 1866, and wanted a new church, but the Masons refused to yield their half, so they purchased the building in 1906 in an attempt to save it. By the next year, however, they agreed to let the small, old building come down. Jesus Chavez was traveling from his home in El Monte to Colton, where he intended to celebrate Cinco de Mayo. During the trip Chavez was under the intoxicating influence of liquor continuously, and for reasons unknown shot and killed one Veranze Mansibai on a lonely road near West Riverside. Chavez went into hiding, but Sheriff Wilson and Under Sheriff Evans eventually encountered his spring wagon. A little further on they found the white and bay horses he was driving. And a little after that, the tiny cabin in which Chavez was tightly holed up, continuing his alcoholiday. There is little hope Chavez will be able to answer to the charges before the effects of his spree wear off.